Our range of Class III medical scales include wheelchair scales, infant scales and baby-weighing scales. MonsterShop stock a wide range of Class III approved medical scales engineered to provide accurate readings for monitoring, diagnosing and treating patients. 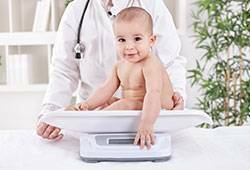 Our range of baby, infant and toddler scales are used by midwives, GPs and nurses in hospitals, surgeries and schools across the UK. Our range provides precise, reliable measurements for medical environments where accuracy is vital. MonsterShop also supply a range of wheelchair scales with a maximum weight capacity of 250kg, measured in precise 100g increments. Our disability scales are designed to be comfortable as well as rigorous, including a host of features such as foot rests and an easy wipe seat and coating for added hygiene. Our medical standard scale range comes with the MonsterShop 12 month guarantee for complete peace of mind.